So, having had Algria paint me, and Judy photograph me, and Cakebread provide me with the ultimate prop, I got a bit carried away, felt fabulous, and asked artist Karin Miller to please photoshop my arms, and create a portrait for this blog, in that order. I first saw Karin's work when she did some spreads for Visi magazine a few years ago, and then I saw the wonderful portrait that she had done for a friend's mother--in-law, the fabulous chef, and inspirational woman, Judy Badenhorst. She also did some covers for De Kat, which I loved. And had several very successful exhibitions at a gallery in Cape Town, where her gently subversive politically intriguing images haunted me. All equally spectacular. And so now here I am, unashamedly copying those far more creative than myself, and so having made myself my very own cover girl... 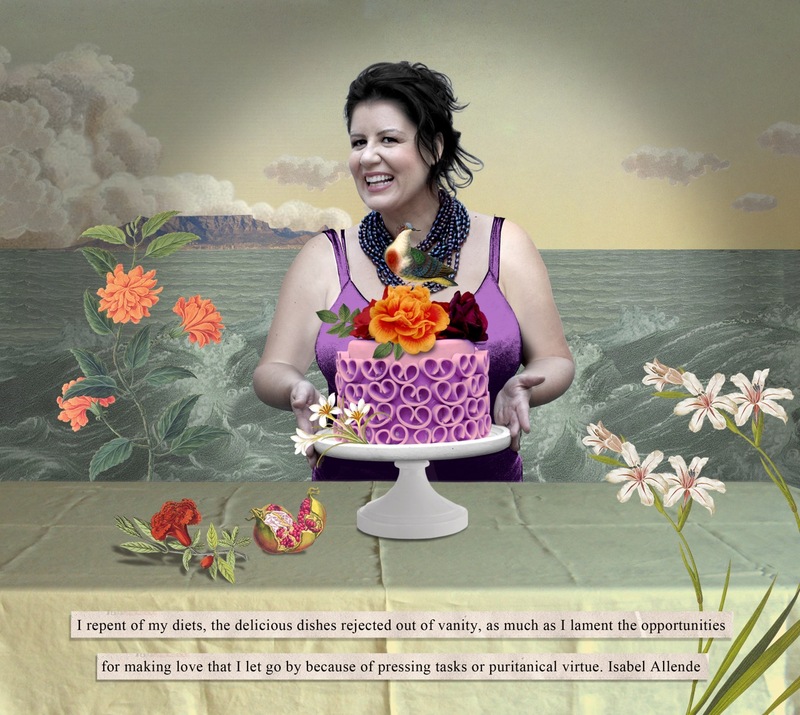 I'm delighted with the photoshopped, Pierneef-esque background, beloved Table Mountain, promise-filled pomegranate and very important Isabel Allende quote from her book Aphrodite. It's a nice picture to look at when I'm having a bad hair day. Like today. Hi, Love the at work created for you.